The Czech team Vonka Racing will be in the line-up at the Mobil 1 12 Hours of Sebring next month, the first entry for a Czech team in the 12 Hours, and only the second for a Czech driver – writes Jan Baranovic. Ah - From memory I can name Karel Dolejší, who raced at Sebring in the mid 1990s, earlier than Tomas Enge - comments Martin Krejci. Vonka tried to be the first Czech team and driver at Le Mans in 1995, I was part of it, he was also in the Sebring entry but was without a suitable car, while Dolejší managed both Sebring and Le Mans, plus some BPR races. Jan Vonka has submitted an entry for himself, (fairly) regular 2005 FIA GT co-driver Mauro Casadei and London-based Dane Bo McCormick. The latter has been a regular in Britcar, in his Ferrari 360, and raced at Daytona last month in the Mastercar Ferrari. He’s going to compete in Belcar this season, again in his Ferrari 360. The team will arrive in Florida on March 12, with being shipped to Florida, after a quick turnaround after last year’s trip to the FIA GT race in China. Tomas Enge is the only other Czech driver to have raced at Sebring. 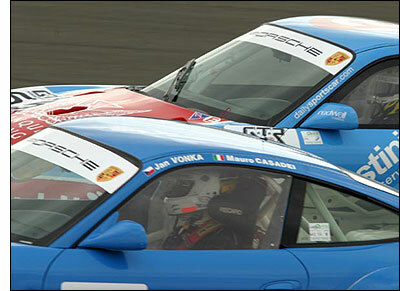 Mauro Casadei is pictured in the Vonka Porsche at Silverstone, last May. Mauro can also organise trips for Europeans keen to follow not just the race but the fortunes of the Vonka team, as he explains. "The aim is to provide an opportunity for people who want to watch the Sebring 12 Hours to do so with the Vonka team - and have a good time in Florida," sums up Mauro Casadei.